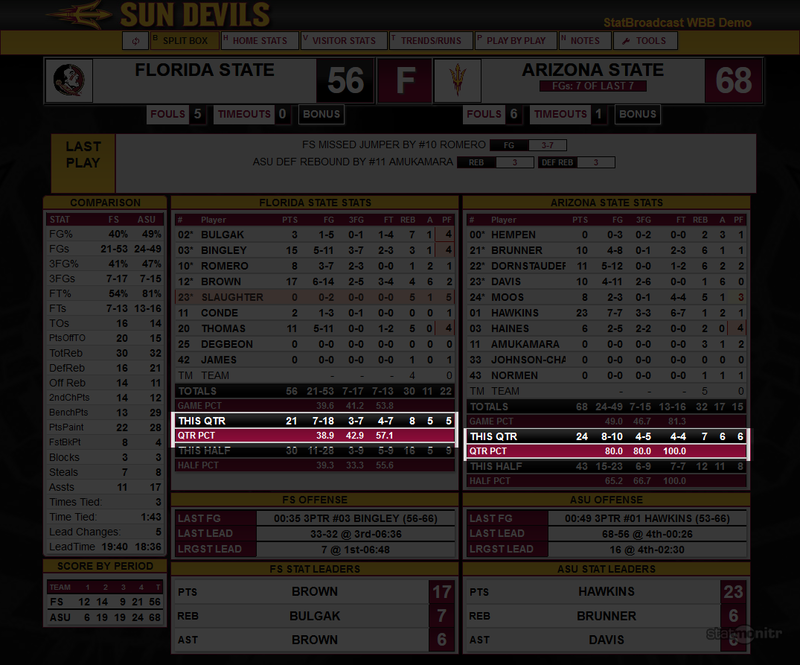 We've added support for StatCrew's recently implemented by-quarter stats in our stats feeds. The most noticeable addition will be on the split-box stats view, where in the second and fourth quarters, the stats feed will include by-quarter team totals alongside the game and half totals for each team. The stats will also be able to pull up a view of the team totals by-quarter, by-half and by-game in the same table for comparison and we have also added team comparison tables by-quarter. 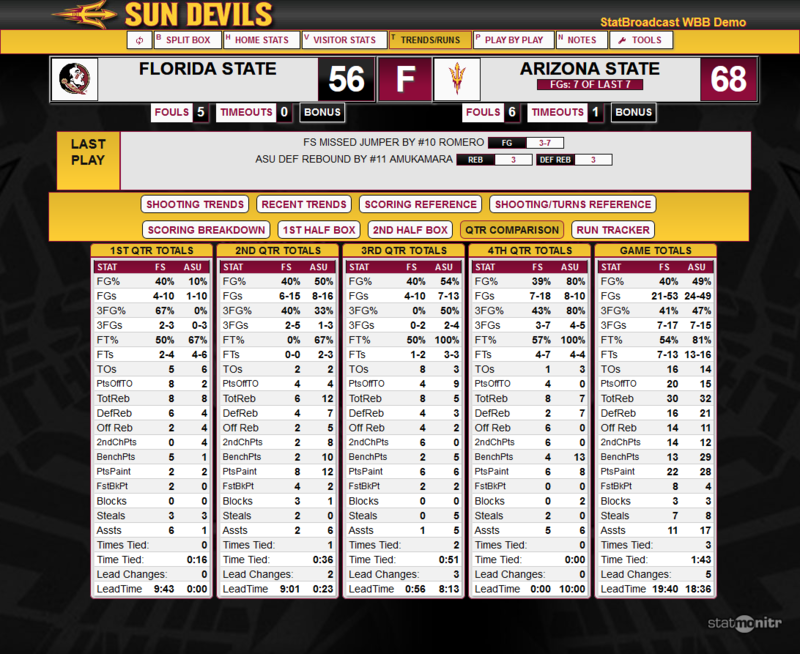 (Please note that the StatCrew update did not include by-quarter stats for each individual player so quarter-by-quarter box scores are still not available at this time). We have also updated our print views to reflect these changes. 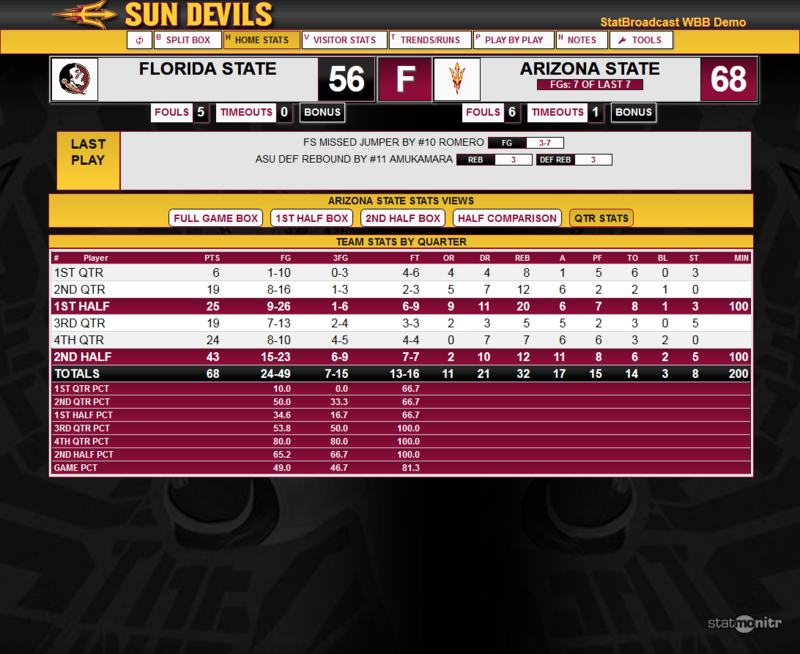 The full game box score will now show shooting numbers by quarter, half and game, and half box scores will display that half's by-quarter shooting numbers. We've also adjusted the specialty stats printouts at the bottom of the by-half box scores to accurately reflect those numbers; the absence of quarterly numbers affected the accuracy of specialty stats on some half box score printouts this season. You will need to download and install the StatCrew Legacy Basketball update 4.17.08 (Dec 15, 2015) or later to see these changes not only implemented in StatBroadcast, but also on any box score printouts you generate directly from StatCrew. I've installed the StatCrew update and I'm still not seeing the quarter numbers. Why? “We hear issues sometimes, where the permissions on the computer do not allow the update wizard to overwrite files, so even though the update extracts files, it does not actually overwrite files in c:\statcrew.